2019 Rent A Lake and Christmas Tree Reservations will be delayed due to technical issues, until FRIDAY, JANUARY 18, 2019 AT 9:00 AM. We apologize for the inconvienience. ▪️The close of business on December 14th, 2018 is the deadline to return all SPRING JAVELINA, SPRING GOBBLER, BLACK BEAR and MOUNTAIN LION draw applications. The draw will be held on Tuesday, December 18, 2018 and the deadline to purchase these tags is December 28th, 2018. The 2018 - 2019 Water Fowl season will be closed due to drought conditions and other seasonal related closures. Weather permitting we will have a 2019 -2020 season. 2018-2019 NON MEMBER HUNTING REGULATIONS & APPLICATION AND TRIBAL MEMBER HUNTING REGULATIONS ARE NOW AVAILABLE ON OUR HUNTING PAGE. OPENING OF RESTRICTED AREAS AND STAGE 2 FIRE RESTRICTIONS ON THE FORT APACHE INDIAN RESERVATION NOW LIFTED. The office of the Executive hereby implements the following restrictions, pursuant to authority vested in the Chairwoman of the White Mountain Apache Tribe by Section 5.3 (B) of the Government Code. Resolution No. 05-2012-25 recognizes the Chairwoman S duty to manage the Tribe's day-to-day operations, and the Constitution empowers the Chairwoman, pursuant to authority vested in the Tribal Council, to represent the Tribe in a government-to-government capacity and act in all matters concerning the welfare of the Tribe. The Chairwoman of the White Mountain Apache Tribe ("Tribe"), by signing this Executive Order, hereby imposes restrictions on public travel to and within specified areas of the Fort Apache Indian Reservation ("Reservation"). The reason for imposing this Executive Order is that a threat currently exists to the Tribe's natural resources, timber, wildlife, economic resources, security, health, welfare, and public safety. It is the intent of this Executive Order to reduce the likelihood of human caused ignition of wildfires in the area depicted on the attached map. 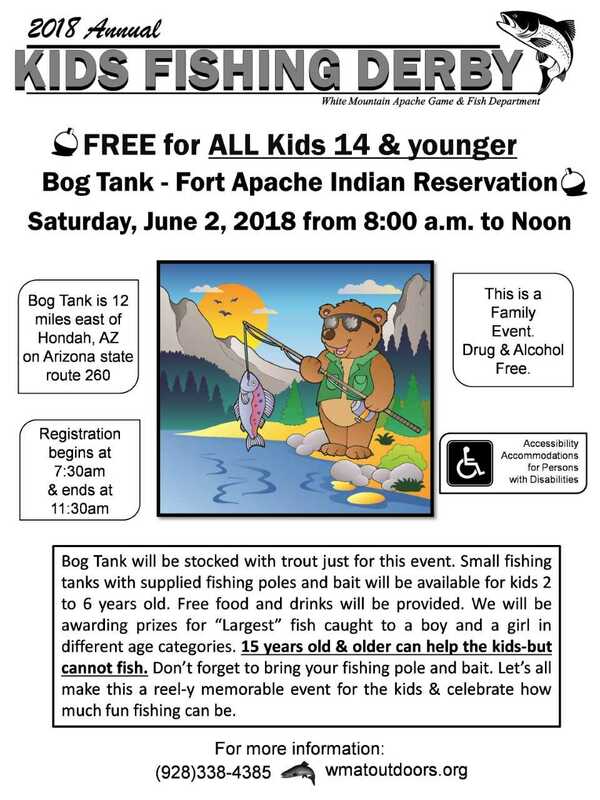 All popular recreational lakes and campsites located on the Fort Apache Indian Reservation shall remain open to the public throughout the summer, subject to the existing Stage 2 Fire Restrictions. All back-country sites on the Reservation will be closed until further notice with an exception for Law Enforcement, Game & Fish Rangers, and the Tribal Forest Ranger. This Executive Order will be strictly enforced due to the unexpected dry weather that has created conditions conducive to accidental or lightning-ignited fires. Traffic will not be allowed on Y70 beyond Seven Mile Hill. Roads within this area, including the R55 Road are closed to the local public. Such roads shall remain open for fire-fighting professionals and individuals on official business, such as relevant Tribal Programs and personnel, Timber harvesting and hauling activities (equipped with fire mitigation measures), WMAT licensed Game & Fish Bear & Lion Outfitters (equipped with fire mitigation measures), and Livestock Associations. Note: Any lake or site not listed above shall be deemed closed. Roads that are used as boundaries of this area will remain open to public traffic. All woodcutting is prohibited until further notice with an exception made for the following areas for ceremonial purposes and wakes only: East of Cibecue Creek; South of BIA Route 12 (Cibecue Creek to Cibecue Junction), US Route 60 (Cibecue Junction to Carrizo Junction) and State Route 73 to Fort Apache; west of White River to the confluence of the White and Black River. Anyone interested in cutting wood for allowable ceremonies and wakes must obtain a firewood permit (no fee) to harvest firewood in the designated area noted above. They must also have hand tools (shovels, rakes, and McClouds) to extinguish any fires that may start. Also, a permit (no fee) is required to harvest other forest products and the poles used in a Sunrise Dance ceremony. The permit will be your pass to and from firewood gathering area and the closed forest. Permits may be picked up at the Fort Apache Agency, Branch of Forestry Office. This Order shall become effective immediately, beginning Wednesday, May 23, 2018. This policy shall remain effective until conditions improve at which time an announcement will be issued by the Tribe to lift the restrictions imposed herein. Anyone that violates this Order shall be subject to fines and penalties up to $2,000.00 and may be subject to imprisonment, where applicable, damages, and federal prosecution if unlawful actions lead to loss of life or natural resources. The Tribal Forestry Department and Fire and Rescue, in conjunction with BIA Fire Management, and Game and Fish, Tribal Police and the Tribal Forest Ranger shall inform the public of any supplemental restrictions and are responsible for monitoring and enforcing full compliance with the policy as stated herein. This Order is to be distributed to all Tribal programs, departments, enterprises, and Federal, local, and State agencies, as well as to members of the news media. Furthermore, all Tribal Agency and Enterprise Supervisors shall cooperate fully and provide any conditions specified in this Executive Order. WHITERIVER, ARIZONA - The Fort Apache Indian Reservation is in extreme drought conditions and fire danger is HIGH. Effective Friday, May 11, 2018 at 7:00 AM, Stage Two Fire Restrictions will be in effect on the Fort Apache Indian Reservation. 1. Building, maintaining, attending or using fire, campfire or charcoal-burning device is prohibited until further noticed, except for fires that are related to traditional ceremonies, religious events, wakes, and residential /tailgate cooking fires. The use of propane campfire or fire pit devices is prohibited as well. 2. Debris burning is prohibited until further notice. 3. Fireworks are always prohibited on the Fort Apache Indian Reservation. 4. Welding or operating an acetylene or other torch with open flame in forest and woodland areas. 6. All motorized travel shall be restricted to developed roads. 1. Power saws may NOT be used from 10:00 a.m. until 8:00 p.m. for any wood cutting/thinning activity except project crews which are properly equipped and performing fuels treatment projects may continue to work until 2:00 p.m. with one-half hour of monitoring by the entire crew following operations plus the provision identified under fire guards. **Fire guards will remain on duty each day for two hours after wood works has stopped. Fuels projects may mitigate this requirement with the addition of fire qualified engine patrols for two hours following completion of operations for the day. This restriction does not apply to residential and commercial properties. 2. Crawler-tractors, skidders, and sheers may be used until 10:00 a.m. Turbine-driven rubber-tired skidders, feller-bunchers, delimbers, and clearing equipment may be used until 12:00 noon. Operation on mineral soil involving road excavating, watering, grading, surfacing, rock crushing, and/or other equipment maintenance may continue with unrestricted hours. Operations NOT on mineral soil must also shut down at 12:00 noon. These restrictions will remain in place until sufficient moisture is received across the Reservation. BIA Fort Apache Agency appreciates your cooperation in protecting the White Mountain Apache lands. For more information, visit us on facebook at, https://www.facebook.com/BIAFAAFireMgt/. Remember only you can prevent wildfires! Northeastern Arizona Public Information System http://311info.net/ or call 311 or 928-333-3412. Tuesday, May 8 at the Whiteriver Fire Department training room. Wednesday, May 9 at the Cibecue Fire Department training room. Thursday, May 10 at the Whiteriver Fire Department training room. Contact the Game & Fish Department at (928) 338-4385 with any questions. Thank you. RABIES WARNING: A bobcat tested positive for rabies on April 18, 2018, in Whiteriver, Arizona. If you or a pet might have come in contact with this animal please call 928-338-3652 and speak with a staff member from the Office of Environmental Health and Engineering at the Whiteriver Indian Hospital. If you see suspicious wildlife, report it to the White Mountain Apache Tribe's Game and Fish Department. Red Flag Warning in effect. NO campfires until 7pm. State Route 473 to Hawley Lake and Hwy 273 past Sunrise Park are both open as of 9:00 am today 4/12/18. There is a Hunter Education Course scheduled for March 16-18, 2018 in Cibecue, Arizona. Course registration can be done through the AZ Game & Fish website: www.azgfd.com. For more information please contact Deon Nashio. 2018 Christmas Tree Lake Fish Camp dates have been set! May 1st through May 13th, 2018! For more information or to make reservations please call or email us. 2018 Rent-A-Lake reservations will continue to be booked online. However, due to the website calendar being down, the initial booking date will be postponed until February 1st 2018 or later. If you would like to be added to a reminder e-mail list please email us at outdoors@wmat.us. Please call us for more event information. Our staff can be reached at 1-928-338-4385. We look forward to your visit!